Easter Weekend - open by appointment only. Call us in advance on 01787 463039 to book yours. Normal Opening Hours:9am-5pm (ish) Mon-Fri. We open weekends & out of hours by appointment. For all musicians, finding the right instrument has always been important and a financial challenge. The ever-increasing cost of quality instruments has created the need for a new funding solution. 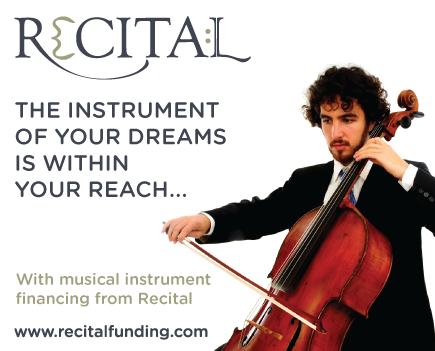 Sandarac is pleased to introduce our customers to such a solution, the new instrument financing service called Recital. Recital, works exclusively with retailers of fine musical instruments such as ourselves to offer a low interest rate financing option directly to you, the buyer. Recital can help you purchase instruments, bows, cases and any accessories as long as they are part of a single purchase. Depending on your credit standing you may be able to borrow up to £25,000 towards your purchase, and payments can be spread over a period of up to 84 months, with deposits as low as 10%. We are very happy to introduce you to this great new, low-interest, funding service that may help you acquire the instrument you need to take your playing to the next level. For more information about the Recital service follow the link here. We are proud to announce that Sandarac has been listed as one of the finest and most trusted music shops in the UK in the new Music Industries Association (MIA) Trusted Music Store scheme. The scheme has been set up to help musicians ensure that they can deal with confidence with any listed store whether simply seeking advice or to buy that new instrument. The Music Industries Association (MIA) has launched the scheme to safeguard instrument sales and aims to create a more harmonious shopping experience all-round. The trademarked TMS logo is now displayed at the Old Dairy confirming our compliance with the scheme’s requirements of stocking a great range of instruments, and being able to provide expert advice, support and guidance for musicians at all levels. Here at Sandarac we have always supported the left-handed player; keeping one or two in stock and getting any of our instruments made at no extra cost. In 2013, to coincide with the 21st anniversary of International Left-Handers’ Day, we launched Southpaw Central; a collection of European, luthier-made, hand-crafted guitars dedicated to the left-hander. A collection which we are reliably informed is the largest of its type; covering classical, acoustic, gypsy, and a Connoisseur. 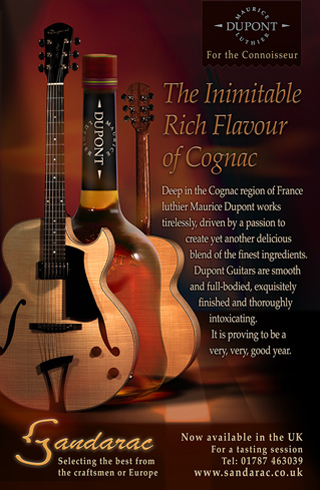 The Dupont range of guitars, basses, amplifiers and pickups have proven to be popular despite the current recession proving that quality will always count. The Auditorium flat tops and the B4E acoustic bass have both received excellent reviews in Guitarist and Bass Guitar magazine respectively. The Be-Bop Jazz Archtop (pictured right) was reviewed in Guitar and Bass Magazine. Whilst that particular guitar is no longer with us we have a Be-Bop together its sister model, the Belleville, available to view at The Old Dairy or at the Guitar Shows listed in our Diary and Events. The unique, collapsible, Volante bass again from the Dupont studios is continuing to create a stir. This fantastic double bass, built with the touring musician in mind: can be seen on tour with The Jools Holland Orchestra and Mario Carrillo respectively. The bass combines excellent playability and a great sound with the peace of mind provided by the instrument’s golf bag sized flight case. The 5-string and left handed versions have proven particularly popular. The French made Volante bass now sits in the Old Dairy showroom alongside its more traditional double bass cousins and the rest of the Kremona bowed instrument range in the Sandarac portfolio. Handcrafted in the Orpheus Valley these traditionally made violins, violas, cellos and basses continue to represent excellent value for money for improvers and professionals alike.